Rogers decided to move to a hosted platform to ensure it has access to the scale and technical roadmap needed to meet the ongoing pace of IPTV innovation. In addition, Rogers customers will benefit from the substantial research and development investments Comcast has made to date and the company’s continuing commitment to innovation. 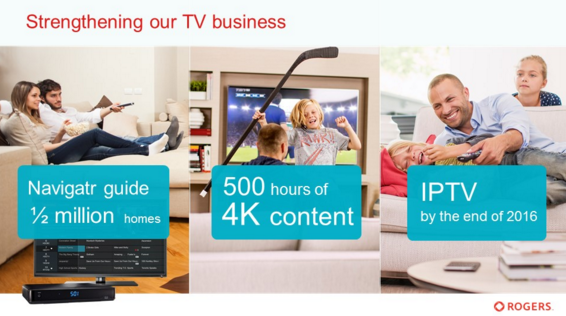 Rogers started developing its own IPTV platform five years ago when no turn-key solutions were available. The company showed investors a prototype in July and said the launch would take place in 2016, but as the technology continues to evolve quickly, using Comcast’s X1 platform, which is also IPTV-based. Other cable providers such as Shaw and Cogeco ditched their own IPTV developments as well in years’ past, with the former now also using Comcast’s X1 platform. Rogers rival Bell already has IPTV and is the largest TV provider in Canada. Rogers and Shaw recently ditched their online streaming service, shomi, which had a write down of $140 million.